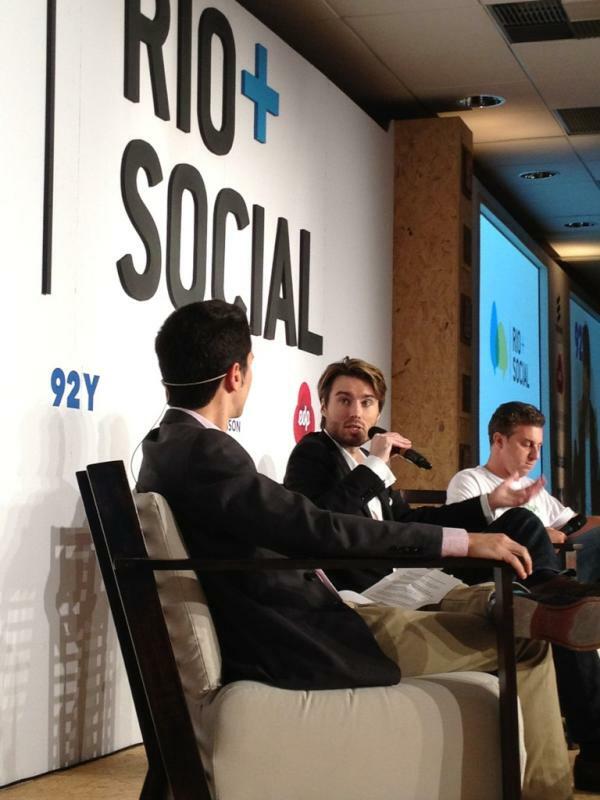 UN News Centre‘s Florencia Soto-Nino met up with Mashable Founder and CEO Pete Cashmore at the the Rio+Social event held alongside the Rio+20 United Nations Conference on Sustainable Development. Here are his answers to three questions about the Future We Want. How did you first think you could link technology and social media with sustainable issues? Mashable got involved in social good very early on. Back in 2007 when there started to be this movement of social media for social good. We actually had a September birthday and we met this charity called Charity Water that was letting people give away their birthdays as a way to raise money on the social networks and instead of giving you gifts people could just donate to Charity Water. We used the Mashable account to raise $10,000 dollars, to build two wells in Africa and that really opened my eyes to how powerful social media could be and it was an embryonic thing and an early thing but I realized this could be very powerful. We had also been hosting events at the 92Y Community Center in New York and we got talking to them about social media and social good coming together, and they had worked with the UN Foundation previously and so it seemed like a great marriage to have a conference. The first year it was a very small conference, but every year it has gotten bigger and bigger and last year the Social Good Summit in September in New York was just huge, we had a lot of big names coming around, Serena Williams was there, obviously Ted Turner comes every year, Desmond Tutu, Richard Gere… it was an all-star line up, but also people who have been doing really great stuff in their own communities, who are just doing phenomenal things and taking them into their own hands to social good. Rio+Social is an extension of that. We are here in Rio talking about specific sustainability issues, how can we bring the social media people in, how can we bring the bloggers in, how can we make this accessible? Because this is really the key thing on the social good summit, you have people talking about the big problems of the world but how do you make it accessible to everyone, so to make everyone feel they can solve those problems? So we get the social media engaged and talking about these issues and hopefully talking about it after this event as well. Which issue is most important to you among those being discussed in Rio +20? I think that the problem that entrepreneurs are most able to solve is how do we come up with creative solutions to the energy problem. Obviously burning fossil fuels is not something that is sustainable in the long term, and we need alternatives to power the world and to power our growth. So I think entrepreneurs are really looking at what are the opportunities, because it’s a win-win, if people can figure out how to solve these problems there is a lot of money in that. I think we are going to see a lot of the solutions to come from the private sector, from companies that really want to innovate because they see a need and a demand. Even in Silicon Valley, which is typically known for computer hardware and software and apps, you see electric cars companies, alternative energy companies, being funded by the same people that funded Internet companies. It is a huge opportunity and I think people are really excited about solving that problem. People were a little skeptical on social activism. Do you think that perception has changed since the Arab Spring? I think it was a problem earlier on and certainly in the earlier Social Good Summit a lot of the dialogue was about how we managed to create a lot of conversations, but is there anyone doing something? So we started thinking about how to raise money, how to create change and make people do stuff. I think people stopped asking that question after they realized that revolutions were happening around the world powered by social media, and it became obvious to everyone that the world was changing very quickly, much quicker than they expected, with political and power structures being upturned, so I think people are less skeptical now, and people are beginning to see that social media can drive a change in action and not just create buzz. I hope that with this Summit we can start the conversation online and really get people a voice and an influence online because this is the role of social media. I think people may sometimes feel disenchanted that things are not being done, but we all have a voice now and we all have the ability to change things we do not like. We are not powerless, we can actually do things about it now. This is what events like Rio+Social are about, giving everybody a voice in the conversation so that change might actually happen.